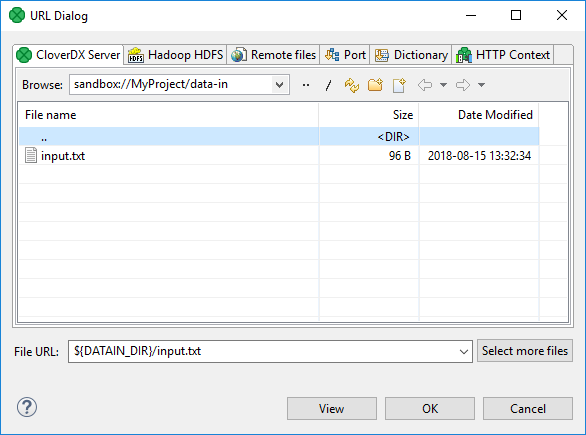 The URL File Dialog serves to navigate through the file system and select input or output files. In many components, you are asked to specify the URL of some files. 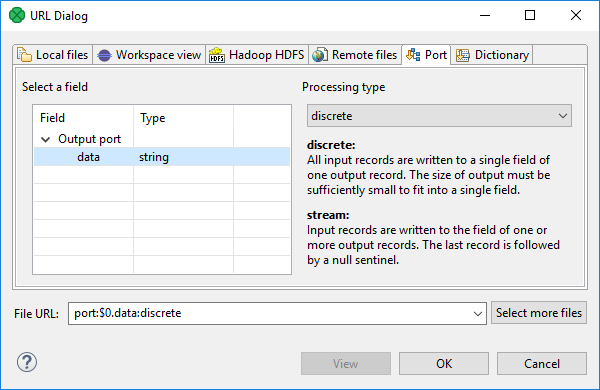 These files can serve to locate the sources of data that should be read, the sources to which data should be written or the files that must be used to transform data flowing through a component and some other file URL. To specify the URL of such a file, you can use the URL File Dialog. The URL File Dialog has several tabs on it. The Local files tab serves to locate files on a local file system. The combo contains local file system places and parameters. It can be used to specify both CloverDX projects and any other local files. Best practice is to specify the path to files with Workspace view instead of Local view. Workspace view with help of parameters provides you with better portability of your graphs. 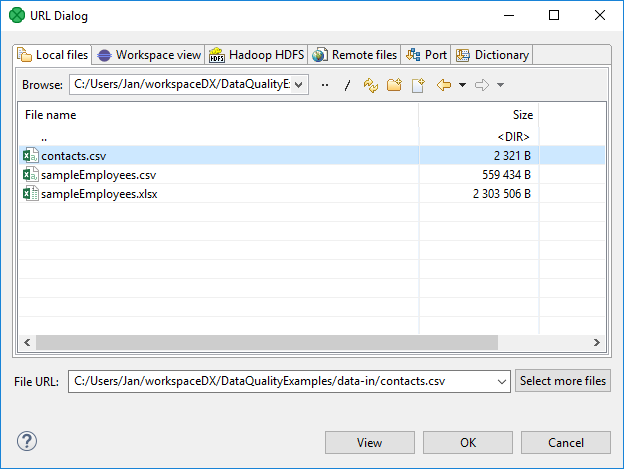 Workspace view tab serves to locate files in a workspace of a local CloverDX project. 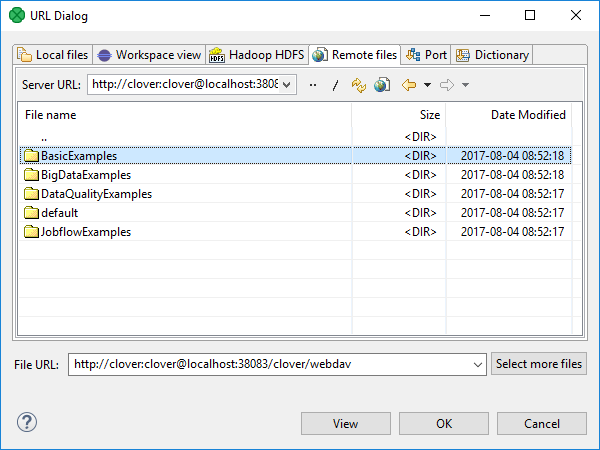 CloverDX Server dialog serves to locate files of all opened CloverDX Server projects. Available only for CloverDX Server projects. 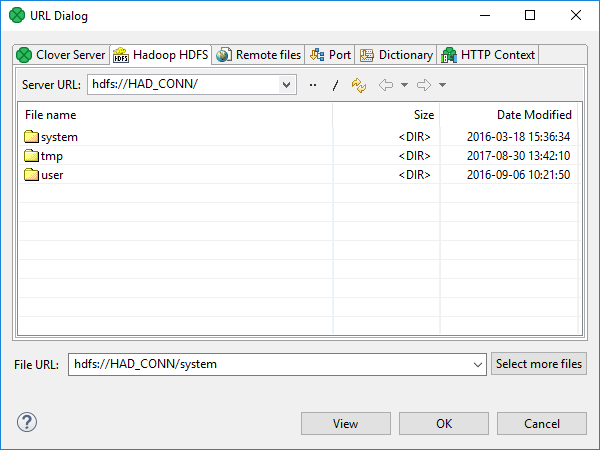 Hadoop HDFS tab serves to locate files on Hadoop Distributed File System. 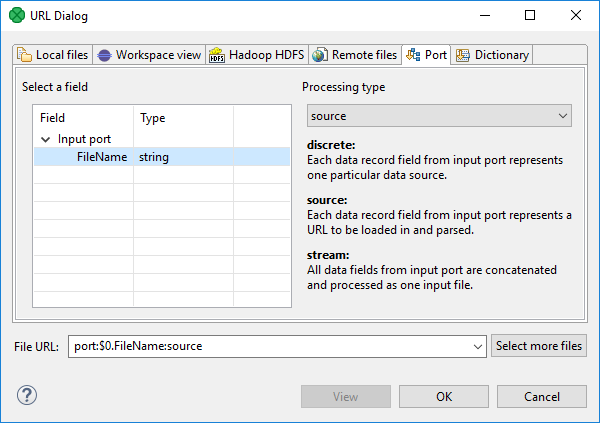 You need a working Hadoop Connection to choose the particular files. The Remote files tab serves to locate files on a remote computer or on the Internet. You can specify properties of connection, proxy settings, and HTTP properties. You can type the URL directly in the format described in Supported File URL Formats for Readers or Supported File URL Formats for Writers, or you can specify it with a help of Edit URL Dialog. The Edit URL Dialog is accessible under the icon . Edit URL Dialog lets you specify connection to a remote server in pleasant way. Choose the protocol, specify a host name, port, credentials, and path. Click Save to save the connection settings. Click OK to use it. The Load button serves to load a session from the list for subsequent editing. The Delete button serves to delete the session from the list. If the protocol is HTTP, HTTPS, FTP, SFTP - FTP over SSH, WebDav, WebDav over SSL, Windows Share - SMB1/CIFS or Windows Share - SMB 2.x or 3.x, the dialog allows you to specify the host name, port, username, password, and path on the server. It allows you to connect anonymously, as well. Put the private key files into this directory and choose a suitable filename with the .key suffix. *.key (the files are resolved in alphabetical order). If you want to explicitly select a certificate for a specific location, the best way is to use the name with the highest priority, i.e. username@hostname.key. In such a case, if the connection succeeds, other keys are ignored. 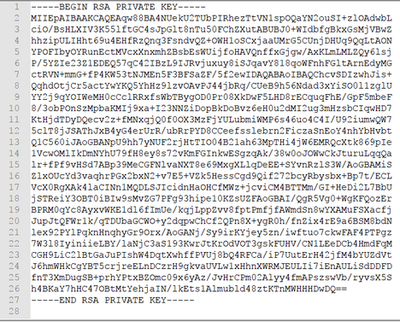 Figure below shows the format of the OpenSSH private key generated by ssh-keygen. Your login on the FTP server. Your login on the proxy server. The hostname of the FTP server. In the case of the Amazon S3 protocol, the dialog allows you to fill in access Key, secret key, bucket, and path. For better performance, you should fill in the corresponding region. Having the connection specified, you can choose the particular file(s). It is recommended to connect to S3 via endpoint-specific S3 URL: s3://s3.eu-central-1.amazonaws.com/bucket.name/. The end-point in URL should be the end-point corresponding to the bucket. The URL with a specific endpoint has a much better performance than the generic one (s3://s3.amazonaws.com/bucket.name/), but you can only access the buckets of the specific region. WARN [main] - Attempting to re-send the request to cloverdx.example.test.s3.eu-central-1.amazonaws.com with AWS V4 authentication. To avoid this warning in the future, please use region-specific endpoint to access buckets located in regions that require V4 signing. For list of regions and endpoints, see AWS Regions and Endpoints (Amazon S3). For detailed information, see the Walkthrough: Using IAM roles for EC2 instances. These sources of credentials may be used for graph development in a local project; for example, set aws.accessKeyId and aws.secretKey Java system properties (for CloverDX Runtime) and add them to CloverDXDesigner.ini (for File URL dialog) so that graphs work in local projects when using S3 URLs without credentials. Serves to specify fields and processing type for port reading or writing. Opens only in components that allow such data source or target. 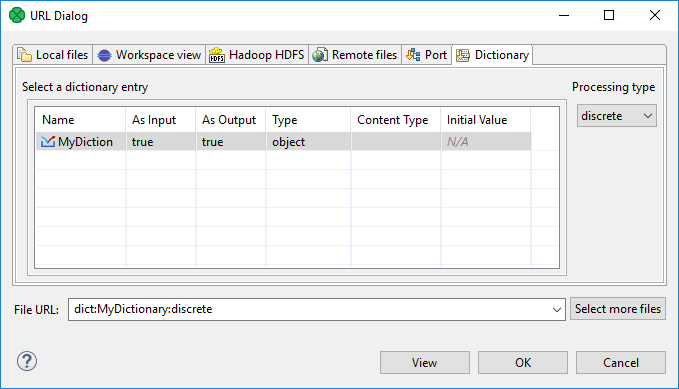 Dictionary tab serves to specify dictionary key value and processing type for dictionary reading or writing. Opens only in components that allow such data source or target. 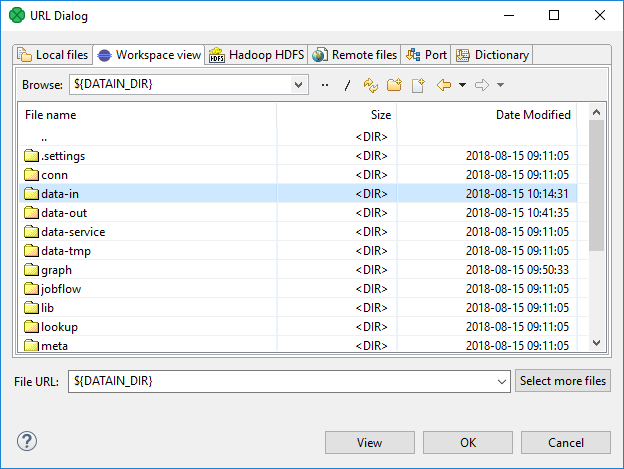 If you use File URL Dialog configured to display only some files according to the extension, you can see the File Extension below File URL. To ensure graph portability, forward slashes are used for defining the path in URLs (even on Microsoft Windows). The New Directory action is available at the toolbar of Workspace View and the Local Files tab. F7 key can be used as a shortcut for the action. Newly created directory is selected at the dialog and its name can be edited in-line. Press F2 to rename the directory and DEL to delete it.